Last Friday's tweet prompted a quick retort from Saudi Oil Minister al-Falih: "there is no such thing as an artificial price." 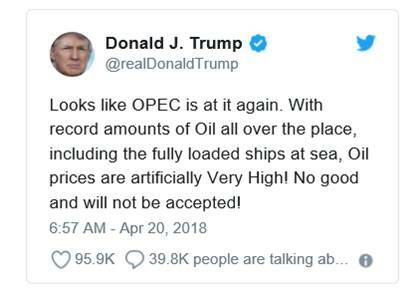 It doesn't require a deep study of OPEC or economics to conclude that, however phrased, Mr. Trump's remark was closer to the truth than his chosen foil's reply on this issue. The more interesting question is whether OPEC's very intentional efforts in conjunction with Russia to tighten oil markets are actually harmful to US interests at this point. Could our instinctive reaction to rising oil prices be based on outdated thinking from the long era of perceived scarcity that began with the oil crises of the 1970s and ended, more or less, with this decade's US shale boom? Let's recall that less than four years ago oil prices fell below $100 per barrel as the rapidly growing output of US shale, or "tight oil" production from wells in North Dakota and South and West Texas created a global oil surplus and rising oil inventories. Oil prices went into free fall around the end of 2014--eventually bottoming out below $30 per barrel--after Saudi Arabia and the rest of OPEC abandoned their output quotas and opened up the taps. That response to the shale wave began the only period in at least four decades when the oil market could truly be characterized as free, when all producers essentially pumped as much oil as they desired. Some referred to it as OPEC's "war on shale." However, those conditions proved to be just as hard on OPEC as on US shale producers, and by the end of 2016 OPEC blinked. The output agreement between OPEC's members and a group of non-OPEC producing countries led by Russia has been in place over a year, and it has taken this long to dry up the excess inventories that had accumulated in 2015-16. OPEC's quota compliance--historically mediocre at best--was aided significantly by geopolitical factors affecting several producers, notably the ongoing implosion of Venezuela's economy and the oil industry on which it depends. Given all this, it's fair to say that OPEC has engineered today's higher oil prices, while its leading members contemplate even higher prices. It's much less obvious that this is bad for the US, which now has a vibrant and diverse energy sector and is finally approaching the energy independence that politicians have touted since the late 1970s. Prior to the shift in the focus of the shale revolution from natural gas to oil, the US was still a substantial net importer of petroleum and its products. In 2010, we imported over 9 million barrels per day more than we exported. That was around half of our total petroleum supply. Today, these figures are under 4 million barrels per day and 20%, respectively. That means that when the price of oil rises, this is no longer followed by enormous outflows of dollars leaving the US to enrich Middle East and other producers. Something like 80 cents of every dollar increase in the price of oil stays in the US, and in the short run the effect may be even more beneficial as investment in US production steps up in response. In other words, when oil prices go up and gasoline and diesel prices follow, the main effect on the US economy is to shift money from one portion of the economy to another, rather than the whole economy springing a large leak. What makes that shift challenging is that consumers come out on the short end, while oil exploration and production companies, and to some extent oil refiners, gain. A useful way to gauge the impact on consumers is to compare one year's prices to the previous year's. When oil prices were falling a few years ago, year-on-year drops of as much as $1.00 per gallon for gasoline (2014-15) put up to $100 billion a year back into the pockets of consumers. That provided a timely stimulus for an economy still recovering from the financial crisis of the previous decade. As oil prices started to recover last year, these comparisons turned negative. Currently, the average regular gasoline price is $0.31/gal. higher than last year at this time. If gas prices were to stay that much higher than last year's for the rest of 2018, it would impose a drag of about $45 billion on consumer spending. $2.75/gal. is the highest US average unleaded regular price for April since 2014. Although gas is still nearly $1.00/gal. cheaper than it was then, memories tend to be short. We may be living in a new era of energy abundance, but I am skeptical that our political instincts have caught up with these altered circumstances. The price of gasoline is still arguably the most visible price in America. When it goes up week after week, consumers notice, even in an economy running at essentially "full employment" and growing at 3% per year. Most of those consumers are potential voters, and this is another election year with much at stake. In that light, I would not expect President Trump to abandon his attack on "artificial prices" for oil, even if it's arguable that the US economy as a whole may not be worse off with oil over $70 instead of below $60 per barrel.